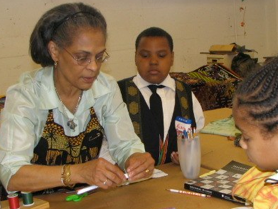 Dreaming Pillow provides at-risk, homeless children and families-in-transition with art activities that foster communication and personal growth while enhancing visual literacy skills. Artists work with children to create “Dreaming Pillows,” beautifully embellished painted fabric pillows that invite the young artists to focus on dreams and possibilities, providing a tangible way for these at-risk youth to express hope for their future. This project recognizes that the creative process can be as vital at the end of life as in early childhood and helps to restore a sense of beauty, dignity, and celebration to residents of assisted living facilities and nursing homes throughout Allegheny County. An art therapist affiliated with Contemporary Craft guides residents through several hands-on projects in a variety of media through a six-week residency. 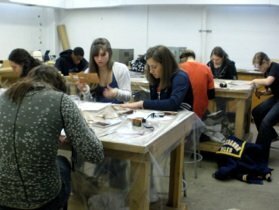 Contemporary Craft’s intensive arts program partners with the Woodland Hills School District to use art in support of interdisciplinary learning in core subjects – math, science, social studies, communications and language arts. Students from 6th, 7th, and 8th grades make craft projects with our resident instructors including fiber artist Tina Brewer, jewelry artist Gerry Florida, and woodturner Linda VanGehuchten.